Zed: Stay close to me – inside my aura! Zed: [watching his memory-scan video of hunting down Brutals] I love to see them running. 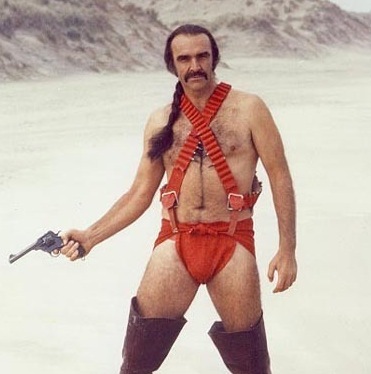 I love the moments of their deaths – when I am one with Zardoz. Avalow: [addressing the populace of the Vortex] Death approaches! We are all mortal again! Now we can say ‘yes’ to death, but never again ‘no’. Now, we must make our farewells: to each other, to the sun and moon, trees and sky, earth and rock, the landscape of our long waking-dream. Avalow: Zed – the Liberator – liberate me now, according to your promise! Consuella: [urgently, to Zed, while focusing on Avalow] Do it! Do it! Zed: [slowly lowering his pistol] All that I was, is gone. Zed: May? I want your help! May: You want to destroy us… the Tabernacle. Zed: I want the truth. May: You must give the truth, if you wish to receive it. Arthur Frayn: You see, our death-wish was devious, and deep. As Zardoz, Zed, I was able to choose your forefathers! It was careful genetic breeding that produced this mutant – this slave who could free his masters! And Friend was my accomplice! Don’t you remember the man in the library, Zed? Arthur Frayn: It was I who led you to the ‘Wizard of Oz’ book! Ha-hah, it was I who gave you access to the Stone! It was I! Arthur Frayn: I bred you! I led you! Zed: And I have looked into the face of the force that put the idea in your mind. You are bred, and led, yourself. Friend: Arthur! We’ve all been used! Zed: What is it you want? Zed: For yourself, or for the whole Vortex? Friend: For Everybody. An end to the human race. It has plagued this pretty planet for far too long. Zed: You stink of despair. Fight back! Fight for death, if that’s what you want. Friend: I thought at first you were the one to help. But it’s hopeless. All my powers have gone. Zed: Where is it? The Tabernacle? Friend: The Tabernacle… is… I can’t remember! Zed: Who made it? Someone must know how to break it. Friend: Yes, but you can meet him for yourself! One of our founders, one of the geniuses who discovered immortality. Friend: We want to die! Hm? What – what’s the trick? Old Scientist: [feebly] Death… death… Talk to May! May! May: Look at it. It’s you. May: Your genetic structure, your life chart. Look. May: You are a mutant, second, maybe third generation – therefore genetically stable. Enlarged brain, total recall. Your potential is… Your breeding potential! May: How did you get into the Vortex? What is your purpose? Zed: I’m just an Exterminator. I know nothing. May: You must know that you’re mentally and physically vastly superior to me, or to anyone else here. You could be anything, could *do* anything. You must be destroyed. May: Because you could destroy us! Zed: As *you* destroyed the rest of life? Can you un-know what you know now about me? May: For the sake of science, I will keep this knowledge from the others, for the time being. But you must follow me, obey me, be circumspect, make no disruption, quietly do whatever work is given you. I will watch over you. Zed: [speaking into the crystal ring on his left hand] Tabernacle – what are you? Zed: Do you know me? The Tabernacle: I have your voice-print, Zed – and your genetic code, but only memory fragments. Zed: [gazing into the diamond he holds in his other hand] Tell me about the crystal transmitter. The Tabernacle: I cannot give information which may threaten my own security. Zed: Brain emissions refract low wavelength laser light, passing through the crystal in the brain. They’re a code sent to you for interpretation and storage. Yes or no? Zed: A receiver must be like a transmitter. I think you’re a crystal – in fact this one! This diamond! In here, there is infinite storage space for refracted light patterns. Yes or no? The Tabernacle: You have me in the palm of your hand! Consuella: [speaking into her ring as she observes Zed asleep in his cage] The Brutal is now in fourth hour of unconscious sleep. It’s astonishing that Homo Sapiens spends so much time in this vulnerable condition at the mercy of its enemies. Is there any data on the sleeping-patterns of primitive people? The Tabernacle: Is that a priority request? Consuella: Yes. I am now going to test its waking response to dangerous stimuli. Consuella: Does it please you to sleep? The Tabernacle: Sleep was necessary for Man when his waking and unconscious lives were separated. As Eternals achieved total consciousness, sleep became obsolete, and Second-Level meditation took its place. Sleep was closely connected with death. May: Friend, I cannot sanction this violence and destruction. Friend: It’s too late, May. There’s no going back. Friend: Time? Wasn’t eternity enough? Zed: [enters suddenly; May wheels to face him] This place is against life. It must die. May: I have my followers. Inseminate us all, and we’ll teach you all we know, give you all we have. Perhaps you can break the Tabernacle. Or be broken. Friend: An end to eternity.